Who else has a sweet tooth?! I’ve personally always had one; I’m a confirmed chocoholic and have pretty much tried every candy that’s out there. Over the years, I’ve thankfully been able to lower the amount of refined sugars that I eat. Being autoimmune, I do know that sugar is one of the worst things that I can eat. 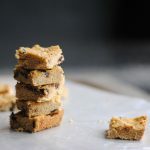 In addition, I also enjoy making tasty gluten free desserts for my family, and this grain free treat is one of ALL of our newfound favorites: paleo coconut flour blondies. Honestly, these come together so quickly and easily – just another reason why I love them. Being grain free, making coconut flour desserts is quite common – but I realize that it may not be a staple in your pantry. 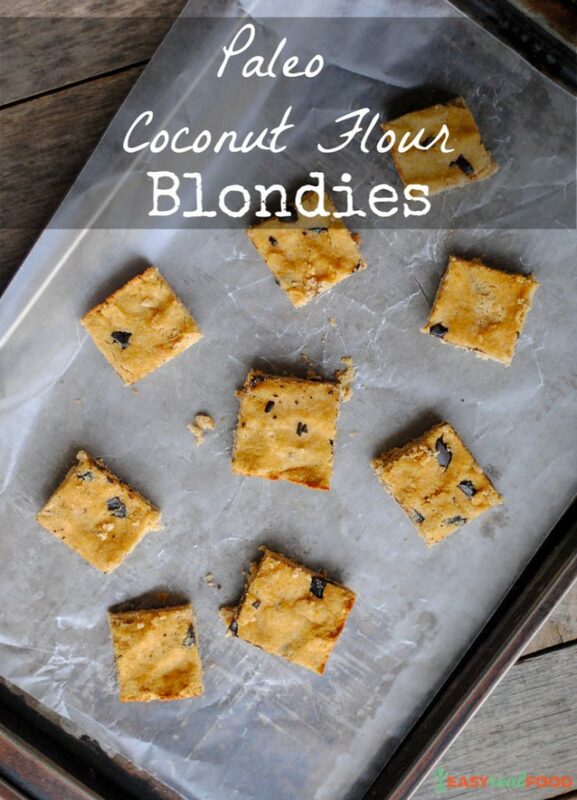 One thing to know is that coconut flour is a gluten free and grain free flour, but it is quite unique in it’s properties and cannot easily be substituted. Please don’t try to a different flour in it’s place. In addition, make sure that you don’t have clumps in your coconut flour and that you add the wet ingredients in the order listed. Don’t add melted butter to beaten eggs, as you don’t want to heat the eggs. If you follow the order below, you will be fine! My choice is always this clean, propellant-free oil spray, and these are my favorite dairy-free chocolate chips. 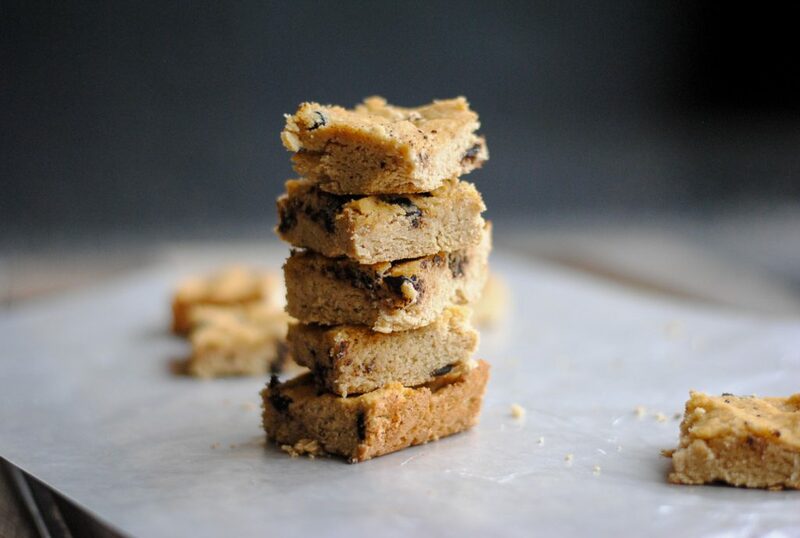 Coconut flour blondies are a delicious, healthy paleo dessert that are grain free, gluten free and super easy to make and bake! Preheat oven to 350 degrees. Prepare an 8x8 baking pan by greasing with coconut oil. In a medium bowl, mix wet ingredients. In a separate bowl, mix coconut flour, cinnamon and baking soda. Add dry ingredients to wet and mix to combine. Fold in chocolate chips. Transfer dough into prepared pan and press down. Add a few extra chocolate chips to the top if desired (press in). Bake 20 minutes. Let cool for 15-30 minutes; place in fridge for 30 minutes before cutting. This recipe is so special! I love that it has no almond flour, way more allergy-friendly etc. 😉 Pinning to make soon! I agree! I can’t do almond flour either, so it’s right up my alley. Hope you love them as much as we do!! Such simple, wholesome ingredients too! What a fun recipe – my girls will love this friday night after a long week at school! Thanks! Oh yum, these look absolutely perfect! 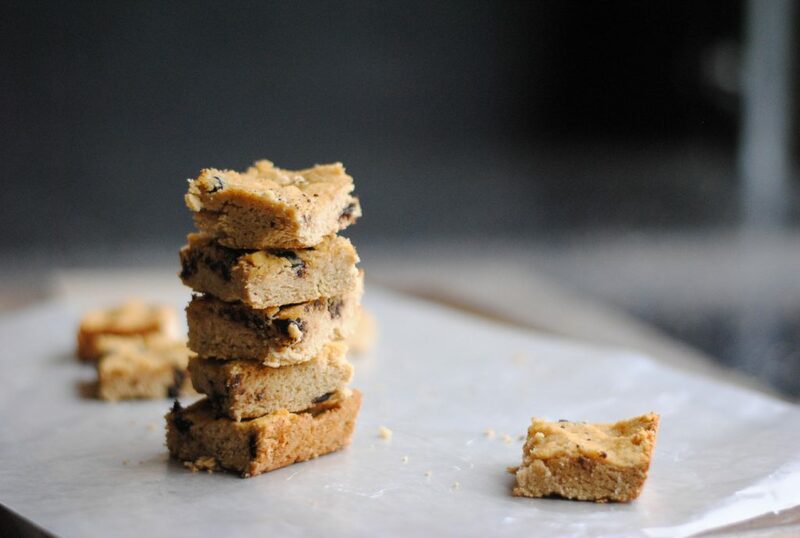 I prefer blondies over brownies and I I have to make these soon! You and me both! Loving them! Love the flavor and texture! Made a great after school snack! Oh yay! So glad you liked them. Thanks for sharing! What a great go-to, paleo snack! I can see this recipe going into regular rotation! Yes! They’re definitely popular over here!! Just in time for lunch! Haha. Seriously, though, these look delicious!